Today I am launching a project that really has no end in sight. It is the pFoody Burger Club. The goal is to check out as many of the burgers that Cincinnati has to offer that we can. Over the last few years I have tried to check out as many spots as possible, but it was without planning. 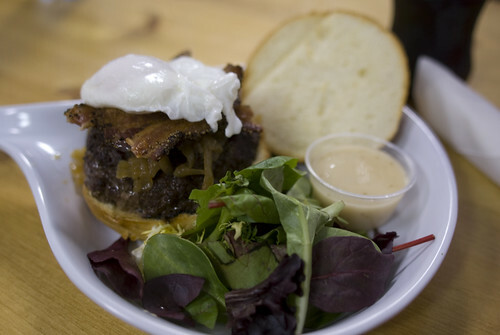 The picture for this article is of the late great “The Burger” from Mayberry. In the pFoody Burger Club we are going to target hitting a new place every two weeks. I have quite a few places in mind, but hope the other members will contribute their own ideas, and the readers will chime in as well. You absolutely talk about Burger Club. We blog about Burger Club. If someone says “stop” or goes limp, taps out they have to be prepared to be mocked mercilessly.. If two or more are gathered together, we have Burger Club..
One Restaurant at a time. Meals will go on as long as they have to. If you come to Burger Club, you HAVE to eat a Burger. The membership is pretty loose. If you know me, or a member, feel free to ask to join as a member, or a guest. I imagine that attendance will be pretty variable, and that is OK (see rule 4). Another way to contribute is to comment. Even if you miss an event (member or not) feel free to add any insights, or counter-arguments you want. To me, a burger does not exist by itself. You need the sides. The classic is fries, but we will explore alternatives as well. We will introduce contributors as they attend. Assuming they want to be associated with a site like this, we will include pertinent social media information like twitter accounts and blogs. Any blogger that wants to post their own thoughts on their site about a burger will be linked to the article. The idea is to hear from multiple voices on the same item. So there it is. Let’s see what happens.